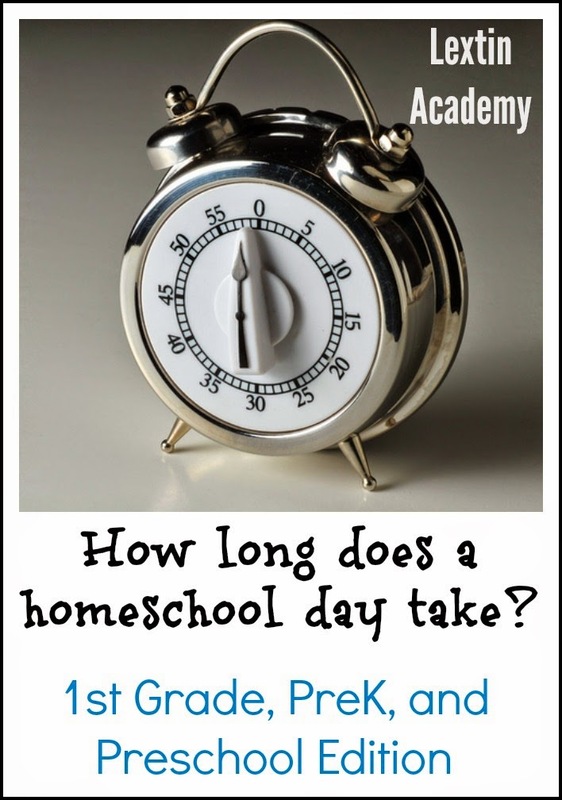 How Long Does a Homeschool Day Take? How long does a homeschool day last? This is an oft-asked question from parents of traditionally-schooled kids and other homeschool moms. Now, the answer varies widely and there’s definitely no right or wrong answer. But how long do you school? When is quitting time at your house? Never! Isn’t that the most accurate answer, since learning never stops? But, really, how long do you school? My daily goal is to have everything done sometime before 4. I don’t want school work to start taking over our evenings. I want our family time! We have a 1st grader, PreK’er and a preschooler. Curly is our first grader this year. I work with her about 1 1/2 – 2 hours one-on-one. Tiger is PreK aged but has already begun some K level work and is starting to read. I spend about 1 hour with him. Bee gets about 30 – 45 minutes of preschool time with me. Ladybug gets time with all 3 of her big siblings and I spend some time every day reading with just her. The key to making sure we get our school work done is our schedule which is a color-coded excel spreadsheet. Yes, I’m that crazy! I have time slots for each child to make sure I don’t lose track of anyone. I get Curly up first before anyone else is awake. She sits at our table snuggled in her blanket and we work together for about an hour and half during our uninterrupted time. During our morning time, we complete language arts (spelling, grammar, vocab, penmanship), math, science, and we sometimes get to some logic or history. Tiger is the next to straggle in and we spend 30 minutes reading together to complete his science and history. We often have time to work on his handwriting and part of his phonics. (During this time Curly works independently on math or some of her workbooks). After breakfast I finish working with Tiger and he gets his second 30 minute block. We finish his phonics and also do math time. Bee is next. We can complete her letters, handwriting, read aloud time, and math in our short time together. It’s just long enough for her! Then Curly comes back in to finish whatever is left from her morning work. Before lunch we rotate piano practice with Curly, Tiger, and Bee all taking turns. After lunch we come together for Bible time while Ladybug naps. The rest of our afternoon is time for violin practice, read alouds, art projects, history projects, or science experiments. Bee and Tiger practice piano for about 10 minutes each. Curly practices for about 20-30 minutes. I also help with violin practice time. Bee and Tiger practice for 15-20 minutes and Curly practices for at least 30 minutes. We spend anywhere from 30 minutes to an hour on our read aloud time. I always have at least 2 books going each week – one geared more for Tiger and Bee and one more for Curly. While I read the kids either snuggle in bean bag chairs or work on art projects or coloring. So, at our house, homeschooling is a full time job for me and it takes all day long when you factor in all the diaper changes, interruptions, temper tantrums, meals to fix, laundry to do, and play time breaks that we take. Now, how I’m going to fit everything in next year is anybody’s guess…..
You'll get it all worked out next year! I like your little color coded chart. I need to work out something like that a bit more for us to go through. I like to get done with school before 4pm too. Love this post. That is a great chart! Thanks! I'm a little crazy with the charts and lists……..it drives my hubby crazy! But I do get things done! Hi Lexi! I just found your blog and am thrilled I did. My kids are similar in age to yours in 2013. (My oldest is in Kindergarten, a preschooler, a 2 year old, and a baby). We are homeschooling with the help of a Christian school nearby where my son goes 2 days a week to Kindergarten. My question is, where in the schedule do you find time to clean the house or do home projects? And how often are you and your hubby able to spend time together? I'm the previous anonymous comment! Sorry just commenting again to click to be notified of a response.